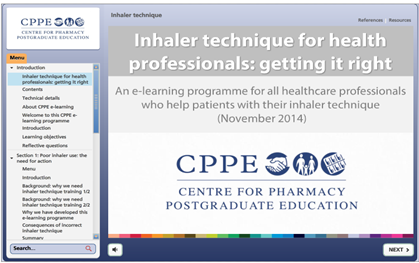 The inhaler technique for health professionals; getting it right has been commissioned by NECS MO with sponsorship funding received from Alimirall, AstraZeneca, Boehringer Ingelheim and Napp to improve how we can help patients with their inhaler devices. Participants will be requested to complete a pre-eLearning questionnaire and will receive a follow up questionnaire to find out how the training programme has changed or supported their practice. The eLearning programme can be accessed through the NECS learning website. This will allow you to track your progress, print out and save certificates and leave feedback. If you have already registered for the NECS learning website click here to login to access the eLearning programmes.